Clinical Decision Support tools are a crucial part of modern healthcare provision. Patient outcomes are improved when medical staff are able to make clinical decisions based on the best evidence, and point of care tools are now ubiquitous across a wide range of clinical settings. These tools can quickly provide clinicians with accurate, reliable and evidence-based information concerning a vast range of conditions and interventions. Clinical staff use these tools to quickly understand the most crucial aspects of a patient’s condition, in the knowledge that information concerning diagnosis, therapy, co-morbidities, risk factors and prognosis is accurate, relevant and up to date. This information allows clinical staff to deliver the best possible patient care. Point of care tools are typically curated by expert panel. Whilst this helps ensure the veracity and accuracy of information, the method is time consuming and costly, necessitating lengthy research, synthesis and publishing processes, as well as debate and agreement by the panel. In contrast to this top down, panel-lead approach, AI technologies are ushering in a new paradigm of clinical knowledge discovery. New and innovative approaches to clinical decision support, in which clinical questions are answered using AI algorithms rather than by expert panel, now offer a quicker and more efficient solution to patient-facing clinical information needs. We will explore this concept by comparing Causaly’s AI engine with market leader UpToDate™, in answering a simple and routine example question: what conditions cause female infertility? Using Causaly, we can use the Rapid Search Module to specifically search for the causes of female infertility (Figure 1). 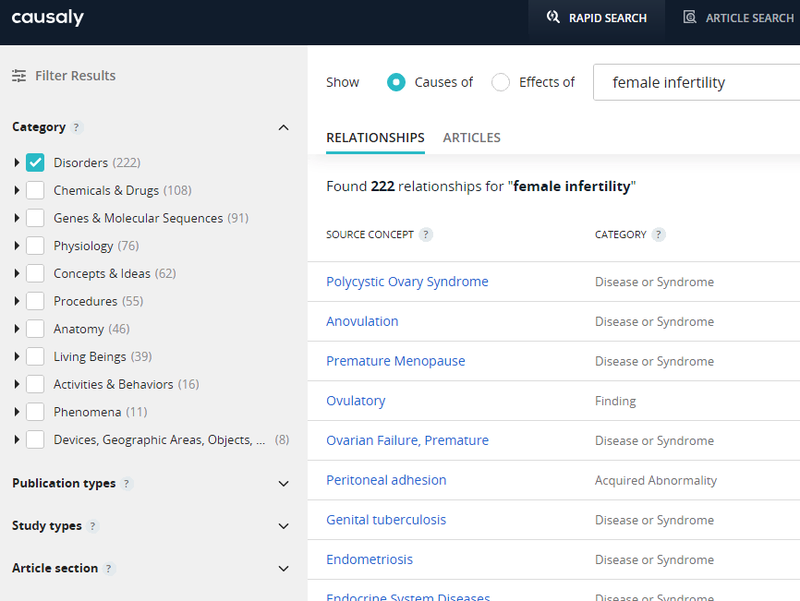 From the results screen, we can use the filter sidebar to display only the Disorders that cause female infertility, bringing us directly to the information which answers our clinical question (Figure 2). From here we can explore each relationship in more depth or export the results as CSV. Searching UpToDate for infertility returns many results, including a topic entitled Causes of Female Infertility. This presents a detailed overview of the topic, with each listed cause referencing the relevant evidence. The causes are not filterable, so the user must read the entire document in order to pull out the conditions that cause female infertility, in order to answer the clinical question. The full results, using both approaches, are detailed in Figure 3. Causaly finds evidence of 75 conditions that cause female infertility, a far more comprehensive list than the 36 presented by UpToDate. 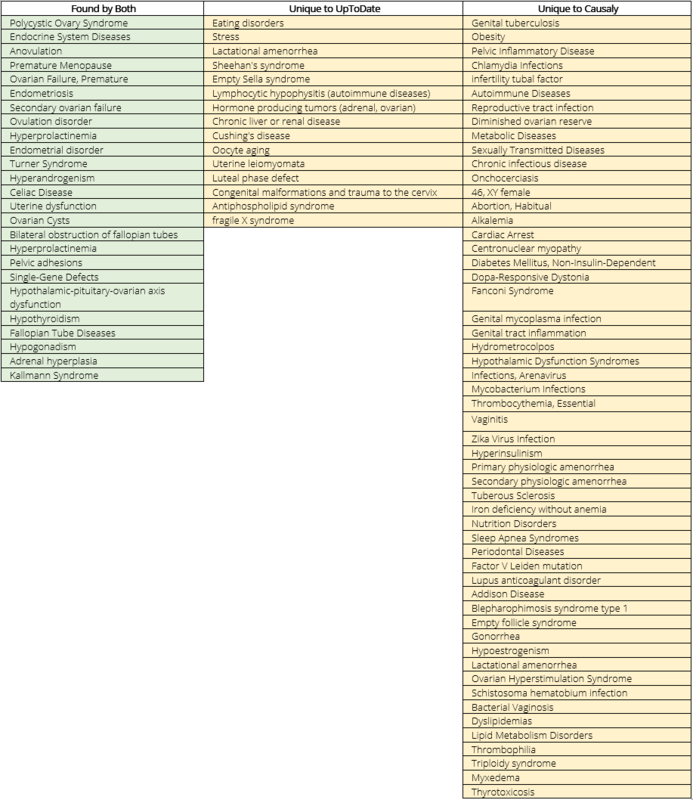 Both systems highlight the 21 most common causes, however Causaly presents 54 conditions that are not listed at all by UpToDate. This list includes factors such as obesity, sexually transmitted disease, Zika Virus, recurrent abortion and many other crucially important conditions that patients and patient-facing clinicians may need to be aware of. Not only does Causaly offer a more comprehensive and detailed clinical picture of a topic, the results are based on more up to date information. Causaly pulls data directly from the current iteration of MEDLINE™, and is therefore always based on the most recent published evidence. By comparison, each UpToDate™ topic is updated by expert panels, with the Female Infertility topic last being updated in 2017. UpToDate™ provides citations to evidence the findings of the topic, meaning that a clinician looking to contextualise or further explore the topic would need to find and read the primary research papers separately. Causaly brings the clinician directly to the relevant passage within the evidence, highlighting the contextual basis of the identified relationship, allowing the clinician to directly and efficiently understand how and why the causal factor is important (Figure 4). The AI model for point of care clinical knowledge discovery has the potential to be more comprehensive and up to date, and provides a deeper and more immediate context than the traditional curated approach. The AI model is also more cost and time efficient, removing the need for a group of researchers to retrieve, synthesise, discuss and update clinical topics. Causaly is able to outperform the established approach by leveraging AI knowledge discovery methodologies to find connections and relationships in the evidence, independently of human supervision. This allows the system to find causal evidence that are unknown or unconsidered by the expert panel, and this approach yields better results and more comprehensive insights. UpToDate is a powerful and popular clinical tool, providing clinicians with extensive coverage of a clinical topic, including treatment and therapy recommendations, clinical pathway guidelines, symptoms and comorbidities. The Causaly AI engine does not currently offer this full suite of functionality, but can provide patient-facing clinicians with a powerful and unique supplement to the existing tools. David Reeves is a freelance clinical librarian and medical writer.